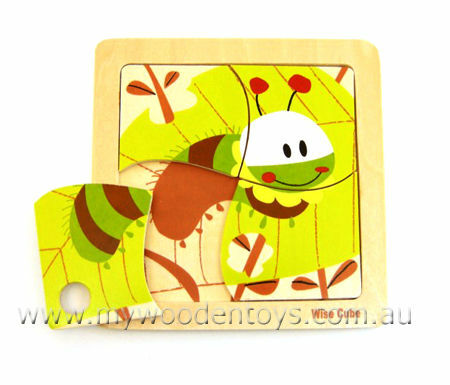 Simple Wooden Caterpillar Infant Puzzle is a sweet four piece puzzle for small children. With smooth edges and no small pieces this is an ideal first puzzle for little ones over 10 months. The four pieces fit into a tray on top of a matching silhouette. The Caterpillar is painted directly onto the wood so there is no paper to peel off if it gets wet. This happy little caterpillar has lovely bright colours and sits in a pretty garden. Size: 15cm x 15cm each piece is approx 6cm. Material: Ply Wood with child safe paint and varnish. We like this because: "Simple, simple and simple also well made and finished."